A programme of literary events will take place in Haworth between 5 – 7 June as part of the annual Brontë Society weekend. Writers Joanne Harris and Justine Picardie will be amongst those taking part in author readings and discussions as part of the weekend of events. To coincide with the new special exhibition focusing on Branwell Brontë, which opens at the Brontë Parsonage Museum on Monday 1 June, writer Justine Picardie and Brontë biographer Juliet Barker will be discussing the life and legacy of Branwell Brontë on the afternoon of Friday 5 June, at 3.30pm in the West Lane Baptist Centre, Haworth. As a child Branwell was considered the greatest genius of the Brontë family, but while his sisters went on to write great novels, Branwell died aged 31 after declining into alcoholism and with a string of failed career attempts behind him. Juliet Barker and Justine Picardie will be debating whether this description of Branwell is fair and discussing some of the remaining mysteries that surround him. Justine Picardie is the author of the novel Daphne, which tells the story of the author Daphne du Maurier’s obsession with Branwell Brontë. Tickets are £5 and can be bought on the door. An evening panel event on Saturday 6th June will see authors Joanne Harris, Amanda Craig, Jude Morgan and Mills & Boon author Kate Walker discussing the Brontës and romance novels. Jane Eyre and Wuthering Heights are often described as being amongst the greatest love stories in literature and this discussion, chaired by Justine Picardie, will look at the ways the novels have inspired romance writers. Huddersfield-based writer Joanne Harris is the author of the bestselling novel Chocolat (which became an Oscar-nominated film starring Johnny Depp and Juliette Binoche). Jude Morgan’s latest novel, The Taste of Sorrow, is a fictionalised account of the life of the Brontës, while Kate Walker has based one of her recent Mills & Boon novels on the story of Wuthering Heights. This event takes place at 8pm at the West Lane Baptist Centre, Haworth. Tickets cost £10 and can be booked from jenna.holmes@bronte.org.uk / 01535 640188. A newly acquired Brontë treasure will go on display at the Parsonage this half-term for the first time. The delicate pencil drawing was recently bought by the Brontë Society from a private owner in the USA, following a successful public appeal and grants from The Art Fund and the MLA / V&A Purchase Grant Fund. 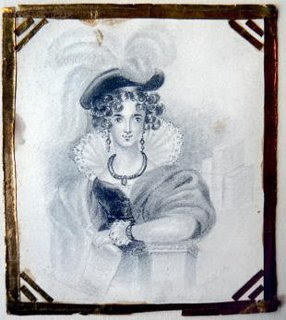 The drawing, by Charlotte Brontë, is a portrait of one of the most significant characters in the Brontës’ early writings, Zenobia Marchioness Ellrington. Zenobia is a strong-minded, independent and intellectual woman, a forerunner to Jane Eyre and other later Brontë heroines. It is thought that the portrait of Zenobia was modelled on the Countess of Blessington, who Charlotte would have been aware of through her friendship with the scandalous Lord Byron - a great inspiration to all of the Brontë siblings. Zenobia is one of three characters all drawn on the same day, in a burst of creativity by the 17 year-old Charlotte. The other two drawings are still in private collections and are only known through reproductions, so we are delighted that visitors to the museum will now be able to see this rare and wonderful drawing for the first time. The Zenobia drawing will be displayed at the museum through the half-term holiday before it is removed for conservation work to be undertaken. Half-term is also a chance to see the museum’s current special exhibition, Who Were The Brontës, before it closes in early June, and the newly refurbished exhibition space, which features the treasures of the museum’s collection and fun interactive displays for families. There are also puppet making workshops for children on Wednesday 26 May (bookings: 01535 640185). There will be a limited number of special, 2 for 1 vouchers available in the village, including the Tourist Information Centre, allowing one adult or child free admission to the museum when accompanied by another adult. I am compiling a census of two Bruxelles 1849 editions of Jane Eyre in French language. If any one knows of any copy other than those listed below, please let me know. 1. The first is: Jane Eyre. Bruxelles: Alp. Lebegue, imprimeur-editor. 1849. Translated by “O.N.” (Old-Nick; i.e. P. E. Durand-Forgues.) 2 v in 1. This is an abridgement of pp143;104. It is discussed by Emile Langlois in Brontë Society Transactions Part 81, No.1 of Volume 16, 1971. It is shown in one copy on COPAC, that at Cambridge and in three copies on OCLC, at Cambridge, Princeton and Leiden University. translator listed. 2 v. Pp [iv] + 269; [iv] + 284. Not discussed by Langlois or listed in any Brontë bibliography. This edition may also be an abridgement, it is difficult to tell. It has 27 chapters and the Jane Eyre, London, first, second, third and fourth editions all have 38. No copy in COPAC or OCLC. I have a copy which so far is the only one located. Neither book shows on American Book Prices Current (ABPC online) for recorded auctions since 1978, or on Artfact or Jahrbuch der Auktionspreise. The Bodleian has not posted their pre-1920 books on COPAC but a check of their catalogue shows they have no Jane Eyre editions, Bruxelles, 1849. The British Library has neither edition. Bibliotheque royale de Belgique and the Belgian Union Catalogue have neither. Bibliotheque nationale de France and the French Union Catalogue locate neither edition. Koninklijke Bibliotheek, the national library of the Netherlands confirms they have neither edition; their search of the Dutch Union Catalog confirms that only Leiden University holds the Alp. Lebegue abridged edition and the Meline edition is not found. My speculation is that other copies will turn up in personal Brontë or Victorian woman writer collections or library shelves of people who have inherited books and don’t know the significance of what they have.